A prolapsed disc in the lumbar spine is an orthopedic medical condition related to the structure and function of the spinal column and the vertebrae. In most cases, however, the reason for the pain is actually neurological: a prolapsed disc between vertebrae of the spine can press on spinal nerve roots adjacent to them producing the main source of pain, and in certain cases, weakness in the foot and problems with voiding. The area of the lower back, also known as the lumbar spine, is considered to be a particularly vulnerable area in terms of everything related to injury to intervertebral discs, a condition that can have many significant neurological implications. Prof. Shimon Rochkind, a world expert in the treatment of everything related to conditions involving peripheral nerves (including nerve branches derived from the spinal cord), treats the neurological damage that results from prolapsed discs in the lower back. At the Neurosurgical Center for Excellence at the Herzliya Medical Center, he performs these operations on a regular basis, offering patients significant relief from symptoms and alleviation of pain. The intervertebral discs are a sort of natural shock absorber found between the vertebrae in the spine. These discs are composed of an enveloping of fibrous rings within which is a viscous gel-like fluid, providing the discs with their flexible nature and their ability to absorb stress and bear the significant weight that the body must deal with on a daily basis. Protruding discs, in which the shape of the disc changes due to the pressure applied to it, causing it to protrude from the spinal column to the spinal canal. Prolapsed disc, when the viscous fluid inside the disc leaks out through a tear (or a number of tears) in the fibrous enveloping. As a rule, the last symptoms in the list are the most severe and require surgical intervention. First of all, it is important to note that not every prolapsed disc requires surgical treatment and intervention. Many people have normal lives with no problems and are often not even aware that they have a herniated disc. This is due to the fact that the prolapsed contents are not pressing on the nerve roots and therefore not causing pain. The surgical treatment is therefore only performed if and when the abovementioned symptoms appear and when the pain becomes unbearable. Prior to the surgery, precise diagnosis is, of course, necessary, using the most advanced imaging equipment by the team of specialists at the Herzliya Medical Center, mainly MRI or CT examinations of the lower back. After precise diagnosis, our experienced performs the operation. Prof. Rochkind has performed many operations for the treatment of neurological problems caused by prolapsed discs. 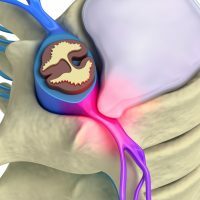 During the procedure, the disc protrusion or the part of the disc that has prolapsed outwards will be removed using microsurgical instruments, including diamond headed micro-drills and a surgical microscope, facilitating completion of the procedure with the utmost accuracy without damaging adjacent healthy tissues. Afterwards, the nerve roots are released from the scar tissue that has formed around the nerves due to the pressure exerted on them. These surgical procedures typically reduce pain and allow for significant relief from symptoms both in terms of their nature and their frequency, almost immediately following the procedure. Are you suffering from severe lower back pain? Are you in need of diagnosis and precise, professional treatment? Contact us today at the Neurosurgical Center for Excellence at the Herzliya Medical Center to get the best treatment available.